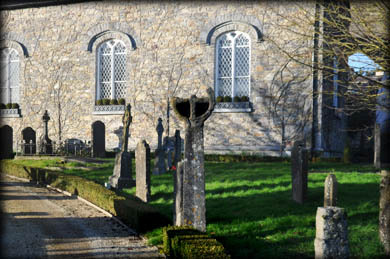 The High Cross in Thomastown stands in the private grounds of the former parish church. The church of the Assumption of the Blessed Virgin Mary, locally known as St Mary's, was built by the Anglo-Norman knight Thomas FitzAnthony, after whom the town is named. FitzAnthony also built nearby Grennan Castle and in 1206 founded the Priory at Inistioge which is also dedicated to St Mary. Slightly earlier in 1193, another Anglo-Norman knight, Geoffrey FitzRobert, established a priory at Kells. 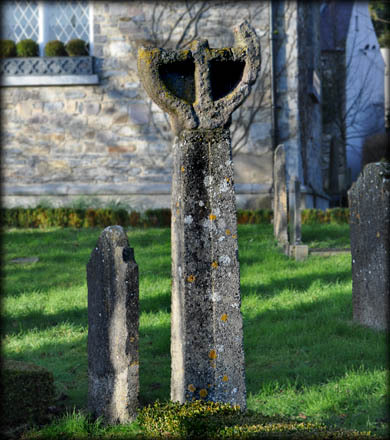 The main priors and monks at both of these monasteries came from Bodmin Priory in Cornwall, so it is not surprising that the late Etienne Rynne, wrote an article suggesting this early 13th century high cross and the one at nearby Dunnamaggan are related more to the stone crosses in Cornwall than the normal Irish high cross. The circular head is sitting on top of a plain shaft, that is probably not original. A portion of the head has been broken off at the top. 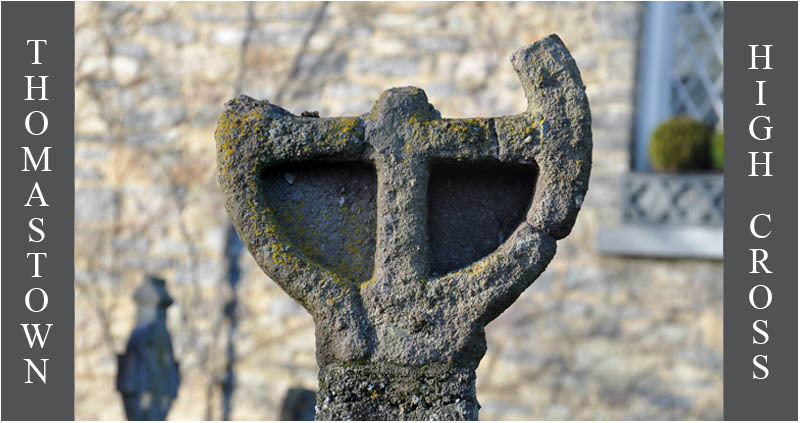 It is similar to cornish cross at Michaelstow, except the ring at Thomastown is imperforate. Situated: St Mary's Church in Thomastown has been converted into a private residence. Access is not permitted without prior permission. Discovery Map 67: S 5841 4196. Last visit Feb 2019.